Let us keep you informed of the latest conservation news. The Carmel Rio Road project includes mixed income residential on 7.9 acres within the Carmel Valley Master Plan. The project applicant is Carmel Rio Road LLC. The project requires a zoning ordinance amendment, an administrative permit and design approval. The project site is governed by the 2010 Monterey County General Plan and the Carmel Valley Master Plan. The County of Monterey is the lead agency. The Project was denied by the Monterey County Planning Commission with a 9-1 vote in May 2017. A letter from the County (387 KB PDF file) dated February 8, 2017 indicates the project is stalled until the applicant pays for additional work on the Response to Comments. The County received Public Comments on the Draft EIR (25.1 MB PDF file) and will issue responses in the Final EIR, which is forthcoming. The County released a Draft Environmental Impact Report (9.8 MB PDF file) and Appendices (28.64 MB PDF file) for the project in December 2016 with a 52 day review/comment period. The County released the Notice of Availability (32 KB PDF file) for the project in December 2016. 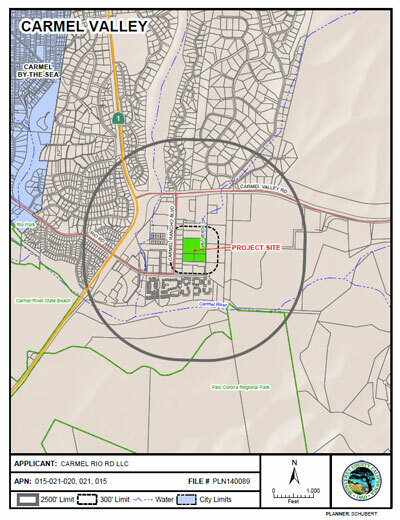 The Carmel Rio Road project is located south of Carmel Valley Road between Carmel Rancho Blvd. and Val Verde Drive. The project violates numerous policies within the General Plan including air quality, aesthetics, hydrology and water quality, and traffic and circulation. The project deferred mitigation measures for hydrology and water quality specifically as it relates to: off-site runoff, waste discharge, and the project’s location in a 100 year flood zone. The project is not consistent with the policies outlined in the Carmel Valley Master Plan, for example the affordable housing component requires a 25% affordable housing component and this project doesn’t meet it. LandWatch engages in the public process in a variety of ways. For this project, here is a list of our engagement strategies.